RENUA IRELAND HAVE made a direct pitch to be in government after the general election and have set out a list of ‘red line’ issues. 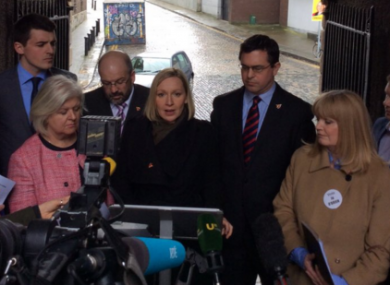 The party officially launched its campaign today with leader Lucinda Creighton saying that it doesn’t want to “take the easy way out on the opposition benches”. Creighton has previously stated that her party would be open to coalition discussions with a number of parties, but a deal with Fine Gael is seen as the most likely route for Renua. Speaking today, she said that Renua will be seeking a mandate to be a “watchdog in government”. If Renua are to join up with a partner in power, they’ve published a list of 10 ‘red line issues’ that they say must form part of any programme for government. Some of these red lines are based around economic measures while others are about the political system an public services. Renua advocates a single flat rate of income tax of 23%. Being the only party that supports this, a flat tax is not one of Renua’s self-imposed red lines. Instead, they want an independently chaired ‘flat tax commission’ to look at Ireland’s tax regime with a view to making a strong recommendation on how the system should change. Renua has also proposed a ‘three strikes rule’ that will result in an automatic mandatory life sentence in prison when a person is convicted of a serious offence for a third time. Creighton says that the party’s red line would be that the Law Reform Commission (LRC) looks at what kind of serious offences this three strike rule applies to. There could conceivably be some wriggle room here with no time-frame for the LRC to report. Renua also want ‘reckless lending’ to become a criminal offence. Other red lines include the extension of PAYE tax credits to self-employed people and a stipulation that Cabinet memos and notes be published within a week of a meeting. Renua describe this final condition as being akin to ‘replacing Cabinet confidentiality with government in the sunshine’. The party also rule out working with Sinn Féin or Michael Lowry in government. Email “This is what a Renua government could look like”. Feedback on “This is what a Renua government could look like”.